Building static sites with React.js using Gatsby.js seem to be more and more a topic of debate when you require an easy to deploy setup, blazing fast speed and smooth developer experience. Gatsby has been consistently growing, and I am super glad to see this shifting trend as we see a large number of blogs, marketing, and e-commerce sites built with it. Every time, you build a site you can help search engine&apos;s crawlers to improve organic search rankings. You have to ensure that search engines like Google can understand your site&apos;s architecture and index it intelligently. You can do all that by including a sitemap.xml file at the root of your site. Considering the growing popularity of Gatsby. *js *#JAMstack sites, I&apos;ve decided to write about how you can automatically generate a custom XML sitemap file in your Gatsby powered websites. So, let’s start with the basic stuff before we get more technical. A website is composed of several web pages like About, Contact, Blog, Subscribe, etc. A sitemap file maintains a list of all these pages to tell search engines like Google about the organization of your site content. Search engine web crawlers like Googlebot read through this file and crawl your site intelligently. Back in the early days of the web, HTML sitemap which was a manually generated bullet-list were in trend. But, owing to their popularity and importance, sitemaps are published in XML format instead of HTML since their target audience is search engines and not people. I hope we can move to JSON format someday. So, an XML sitemap file communicates with the search engines about all the pages which exist on your website. Considering Search Engine Optimization (SEO), sitemaps are very important. However, they do not affect your search rankings. Instead, if there&apos;s a web page which is not indexed, then sitemap tells the search engines about that page to get it appropriately indexed. Sitemaps are equally important for both new, and old sites. Especially if your site is relatively new then I&apos;d definitely recommend adding one since it is difficult for search engines to find posts and pages of a new site. You want to make the search engine&apos;s job as easy as possible to get the most out of it. You will find sitemap.xml files on literally every popular website. This helps the search engine bots to keep a tab on various updates and basically everything that goes about on a site that should be indexed. One key highlight of Gatsby is its growing collection of plugins which implement Gatsby API through simple NPM packages. With time, good folks behind Gatsby have built an extensive ecosystem for plugins which helps you to extend and modify web functionalities. Now, to create a sitemap you don&apos;t have to bother writing several lines of code. There is a Gatsby plugin to generate the sitemap file called the gatsby-plugin-sitemap. Before I dive into its installation make sure you have a Gatsby site up and running. Recently, I purchased my Maedah.dev domain where I&apos;ll be creating a sitemap file since I am setting it up a new blog with Gatsby. It&apos;ll take just a few seconds to install. After the plugin is successfully installed, now it&apos;s time to add this plugin to the gatsby-config.js file. A quick reminder to those who are new to Gatsby; that inside gatsby-config.js file you&apos;ll find all the site configuration options which are placed in the root folder. One of these configuration options is for plugins. Here you find an array of plugins which implement Gatsby APIs. Some plugins are listed by name, while others may take options as well — and gatsby-plugin-sitemap carries options as well (more on this later). Make sure that the inside siteMetadata you change the title and siteUrl according to your project details. To create a sitemap you need to generate a production build and start the server. In your terminal type the following command and hit Enter. By default, the sitemap is generated in the root of your website which is a folder called public . When you deploy your site, you can access it through /sitemap.xml and it will display all of your site’s pages which are currently accessible to users. But as I have mentioned earlier that the gatsby-plugin-sitemap plugin supports advanced custom options so this default functionality can be changed accordingly. Let&apos;s dig a little deep with these options. output: The default file name is sitemap.xml you can use the output option to change the name of output file. E.g. with output: &apos;/some-other-sitemap.xml&apos;, the URL now becomes https://yoursite.com/some-other-sitemap.xml. exclude: This option can help you exclude any links from the sitemap for whatever reasons. query: Custom GraphQL query to fetch info like siteMetadata, siteURL, allSitePage, etc. There are a couple of other handy options as well for e.g., for sitemapSize and sitemap index. You can visit the official plugin repo for more info here. For the sake of sharing an example, I tried customizing the plugin&apos;s options to generate data of my choice. Here, I have customized the GraphQL query that I will explain below. Here, I am using the query option to fetch data for my site which includes info about siteMetadata and siteUrlNoSlash. Further, I am quering the allSitePage to get all site pages URL paths i.e. to retreiving path property for each graph node through all edges. And finally, I used the allMarkdownRemark which reads files written in markdown and then converts them into HTML pages. Here we are getting the slug info for each markdown post from inside the field property. Towards the end, I&apos;ve called the serialize function to map data which is fetched for allSitePage and allMarkdownRemark. Each returns a page url with changefreq: &apos;daily&apos; and a priority: 0.7. This was one demonstration of playing around with custom options for the gatsby-plugin-sitemap, you can do it according to the requirement of your project. Moreover, for a live demo of sitemap.xml file, I created it in the VSCode.pro course site that my better-half Ahmad Awais had built. 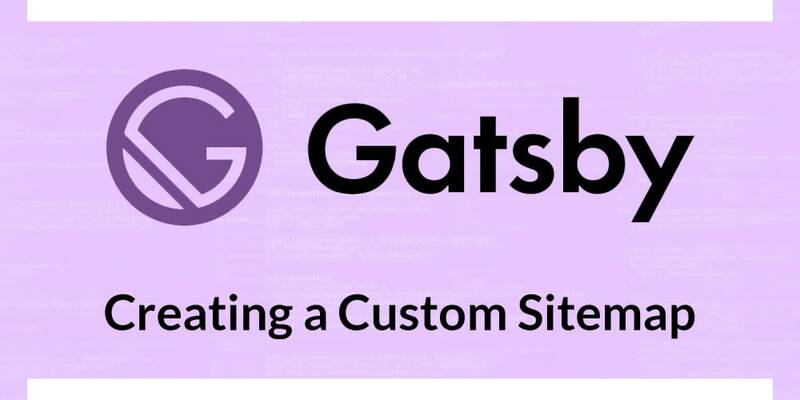 You can access this live sitemap demo for Gatsby.js here. That&apos;s about it! Generating sitemaps should now be very easy with Gatsby.js. With time, Gatsby has stepped up its game in performance and a lot of effort is being put in improving the DX (Developer Experience). The result of creating a sitemap.xml file with gatsby-plugin-sitemap is a clear indication for that. Now it&apos;s your turn to try it out and let me know about the feedback in the comments section below.